A higher intake of vegetables, but not fruits, significantly reduces the risk of developing type 2 diabetes, according to a new study reported in the Journal of Nutrition. The study, which involved 64,191 middle-aged Chinese women, showed that a high intake of vegetables — including cruciferous vegetables, green leafy vegetables, yellow vegetables, allium vegetables, tomatoes, and other vegetables — was associated with an almost 30 percent lower risk of diabetes compared to those who ate the lowest amounts. A high intake of fruits, on the other hand, was not associated with a reduced risk of diabetes. Eat real food kind of goes without saying. But we need to get back to that and steer away from thinking of foods as carriers of nutrients that manufacturers can manipulate for the better for our health, keynote speaker and The New York Times best-selling author Michael Pollan told a capacity crowd at Natural Products Expo West last week. Natural Products Expo West is the country’s largest natural, organic, and healthy products trade show. It was larger than ever this year: More than 52,000 retailers, manufacturers and industry professionals attended the show to see a record 3,392 exhibits in the Anaheim Convention Center. “Gluten-Free” was an extremely popular category of products – even hotter than it has been the past few years. There were a number of healthful, whole-food, gluten-free products at the convention. However, it is amazing how many companies offer highly refined gluten-free products that people think are healthy just because they’re gluten free. Pollan’s comments on the changes that have taken place with our food and the way we look at food offers some much-needed perspective so we can make smarter choices in the foods we buy. News Flash: I am now writing the monthly “Go Gluten Free” column for Better Nutrition, a complementary magazine distributed in natural food stores across the United States. You can look for it at a natural food store near you. The magazine ran my first column in its March issue – and I’ve already written the next several columns. 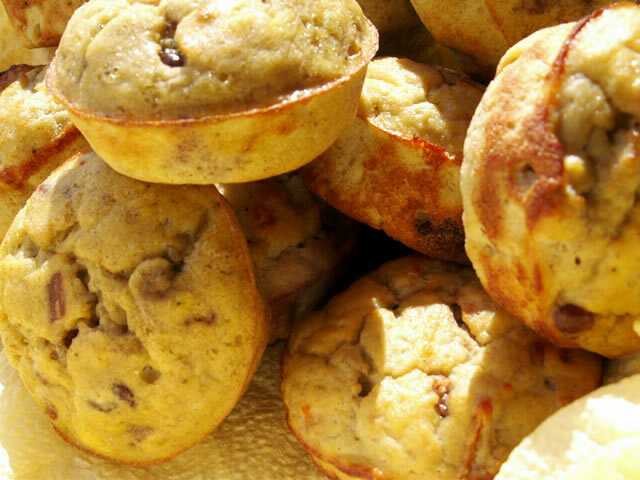 Want to know how to make these delicious, gluten-free, grain-free, sugar-free muffins? Join the online Going Against the Grain Group! The Going Against the Grain Group goes further than just offering you against-the-grain nutrition news. It offers ongoing nutritional support all year long with quick and easy meal ideas, recipes, food preparation tips, special reports, nutrition lessons and information about helpful food products, including early announcements of new products and products that fare best in real-life taste tests. Eating a Stone-Age-type diet with no grain products is considerably more effective at lowering blood sugar levels and reducing waist sizes than the often-recommended Mediterranean diet that contains whole-grain foods, according to a study by Staffan Lindeberg, MD, PhD, and his colleagues at Lund University in Sweden. In the study, the researchers asked 14 patients to consume an “ancient” (Paleolithic or Stone-Age) diet with lean meat, fish, vegetables, fruits, eggs, and nuts, but no grains or dairy products. Fifteen other patients were asked to follow a Mediterranean-like diet that included some of the above foods along with whole-grain foods and low-fat dairy products. Both groups of the patients had serious heart disease, plus either type 2 diabetes or a less severe form of glucose intolerance. The Gluten-Free Diet – A Recipe for Unhealthy Weight Gain? The vast majority of people who go on the gluten-free diet as it’s conventionally prescribed gain weight – and nearly one-third who are normal weight become overweight. So says a study in the October 2006 American Journal of Gastroenterology. Gaining weight is desirable for people who are underweight when they are diagnosed with celiac disease. However, contrary to popular opinion, there are few underweight celiacs: only 4 percent of 371 patients in this study were underweight when diagnosed. It’s much more common to be normal weight or overweight at the time of diagnosis. Of the patients diagnosed with celiac disease over a ten-year period in a clinic in northern Ireland, 39 percent were overweight and 57 percent were normal weight.